“Candy flavors mask the taste of tobacco, which I’ve been seeing become more popular among my peers,” Academy senior Agnes Brown said. As a youth council member for the Coalition for a Tobacco-Free Hawaii (CTFH), Brown joined state lawmakers, health organizations and other students in the anti-flavor-tobacco initiative earlier this month. 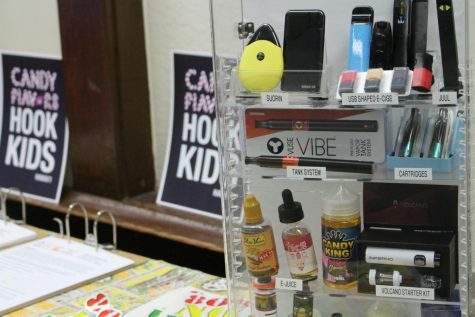 The public display brought attention to two bills that would make Hawaii the first state to pass a ban on flavored tobacco products, which advocates say the tobacco industry has used as a way to target youth. HB276 and SB1009 would eliminate the sale of products statewide, including electronic smoking products. Both bills are currently being reviewed and, if passed, would take effect January 2020. National studies show more than 80 percent of youth who use tobacco start with a flavored product, while 95 percent of smokers start before the age of 21. In Hawaii, 1 in 4 high school students regularly use electronic cigarettes, or e-cigarettes, according to the state Department of Health. “The purpose (of the bills) is to reduce the number of people, in particular youth, that use tobacco products,” CTFH Youth Coordinator Scott Stensrud said. An assortment of e-cigarette devices displayed at the Academy during a CTFH presentation to teachers and parents. Photo by Noe Nekotani. Juuls, a type of e-cigarette that looks similar to a computer flash drive, have become increasingly popular with middle and high school students. Its sleek design and appealing flavors mask the high concentrations of nicotine, which can be damaging to brain development. A 2017 study by Truth Initiative reports that one-fifth of youth ages 12-17 has seen Juuls in school. Of the more than 15,000 available flavors, CTFH says flavors like Molokai Sweet Bread and Li Hing Mui specifically target Hawaii’s youth. “We’re up against the industry, (and) to counter the money the industry is pouring into defeating this bill, we need to gather even more supporters,” Stensrud said. In 2016, the tobacco industry spent about $9.5 billion on advertising and marketing, according to the Center for Disease Control and Prevention (CDC). Although a person must be at least 21 years old to buy tobacco products, Stensrud said teens obtain products through friends, older family members or online. Local businesses, such as VOLCANO eCigs, disagree and point to their policy on checking identification. Despite the policy, the company still encounters many underaged customers. The company has several shops throughout Oahu but also sells products online. To view Juul’s website, users must verify that they are at least 21 years old. Screenshot courtesy of Juul’s website. The Truth Initiative states that youth, age 15 to 17, are 16 times more likely to use a Juul, as compared to those ages 25 to 34. To combat these statistics, the youth council–consisting of high school and college students–continues to advocate during legislation. In 2016, the council helped raise the age of tobacco sales to 21 years old. This was a first for any state. It also helped pass a law prohibiting smoking in cars with kids throughout Oahu. The council advocates against tobacco use through community presentations and policy change at the local and state levels. “Being part of this youth council is my way of lessening the effect of this epidemic,” Academy senior Brown said. The most impactful way to get their message across, members say, is through peer-to-peer outreach. Youth advocates recently presented to more than 20 schools and organizations, including the Hawaii High School Athletic Association. This week, Brown presented to Academy students and families about teen tobacco use, specifically vaping through the use of e-cigarettes. In addition to peer-to-peer outreach, youth council members have produced videos used as part of the 808 No Vape Campaign, as well as participated in the Breathe Aloha mural project. The murals can be seen throughout Hawaii high schools. They are meant to encourage tobacco-and-vape-free lifestyles. Later this month, Brown and other youth council members will participate in the national Kick Butts Day. The initiative raises awareness about the dangers of using tobacco. More than 1,000 events in schools and communities around the world are expected to participate. Sacred Hearts Academy students gathered yesterday for a special morning assembly announcing new Head of School Dr. Scott Schroeder. He replaces Betty White, who has been at the Academy for more than 40 years. Schroeder, a former Academy Board Member and chair, will start in July 2019. Following White’s official retirement announcement in January 2018, a 6-month-long search for the new Head of School commenced. A pool of applicants was then submitted to the Members of Sacred Hearts Academy for further review. White has been an educator at the Academy for 50 years. This year marks her 17th year as the Head of School. Schroeder was chosen based on his high scores in the key elements that exemplified a befitting successor to White’s legacy, such as, education experience, leadership and business acumen, academic and student affairs experience and Board relations. He most recently served as Dean of the School of Management and Communication and Professor of Management at Chaminade University. Schroeder was also commended for his five-plus years experience of being a Board member for the Academy, aligning his beliefs in the Catholic faith, as well as reinforced professionalism and passion as an educator from supervisor references. Sacred Hearts Academy held its first-ever talent show recently in an effort to add variety to the usual school assemblies. Instead of student and faculty games, the talent show showcased student-performed hula, singing and dancing. “I liked how everyone supported the acts, even if they were in different grades,” junior Chanah Tanioka said. She helped plan the event as a member of the student council. According to her, the assembly was meant to spotlight students who do not normally have the opportunity to show off their talents. Among the performers, junior Rachel Javier sang “I Have Nothing” by Whitney Houston. 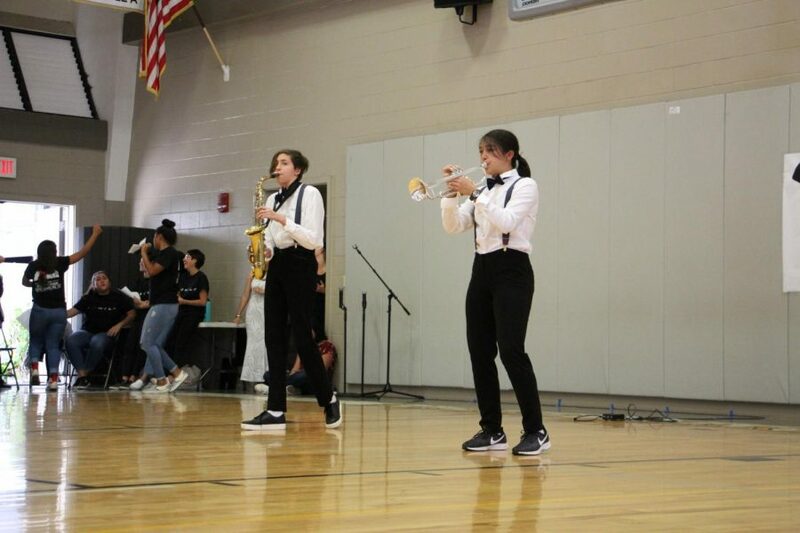 Sophomores Catherine Loiselle and Elena Amado performed, with their instruments, “Mobamba” by Sheck Wes. Both Javier and the instrumental duo won first place for their categories. “It was exciting and refreshing to see fellow classmates being brave enough to share their talents and have a good time,” junior Isabella Johnson said. CyberPatriots Place in State Rounds, Advance To Semi-Finals!